PhD Smart Bar Cookies & Cream is a great tasting, triple layered bar which is low in sugar and high in protein. Protein Blend [Milk Protein, Collagen Hydrolysate, Soya Protein Isolate], Caramel Layer [Sweetener (Maltitol), Condensed Milk, Cocoa Butter, Water, Humectant (Sorbitol), Emulsifier (Mono And Diglycerides Of Fatty Acids), Flavourings (Milk), Salt, Colour (Plain Caramel)], Sweetener (Maltitol), Soya Crispies [Soya Protein Isolate, Rice Flour, Barley Malt Extract (Gluten), Salt], Cocoa Butter, Humectant (Glycerol), Whole Milk Powder, Water, Cocoa Mass, Coconut Oil, Flavourings (Milk), Emulsifier (Soya Lecithin), Natural Vanilla Flavour. 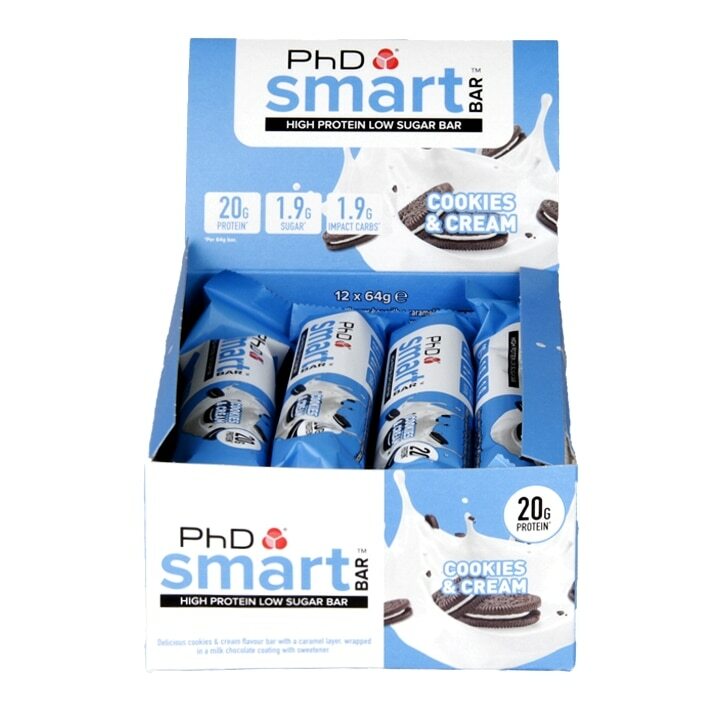 PhD Smart Bar Cookies & Cream is rated 4.8 out of 5 by 12. Rated 5 out of 5 by Katiecurves from Fills you up My favourite flavour. I have one a day so I feel as though I'm getting a treat without the sweet calories. Has helped me lose weight with my diet and exercise routine where I had started to plateau. Has stopped my evening snacking. Rated 4 out of 5 by Josepiee from Great protein boost Easy to top up on the go and tastes very good! My wife power lifts and loves these bars!